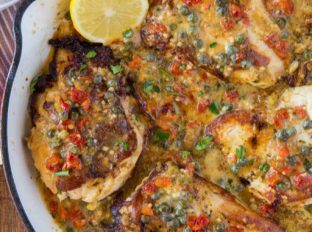 Olive Garden’s Chicken Piccata is a delicious take on the classic with butter, lemon, capers, sun dried tomatoes and heavy cream. You won’t miss the restaurant version! Looking for more fun Italian Copycat recipes? 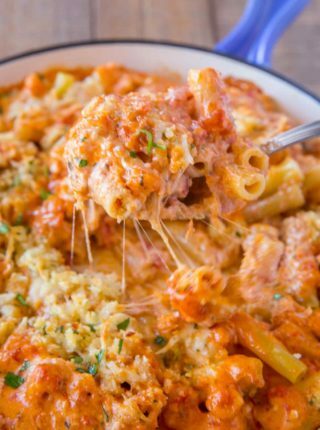 We love the Cheesecake Factory Chicken Madeira (Copycat) and Cheesecake Factory Pasta Da Vinci (Copycat) recipes too! 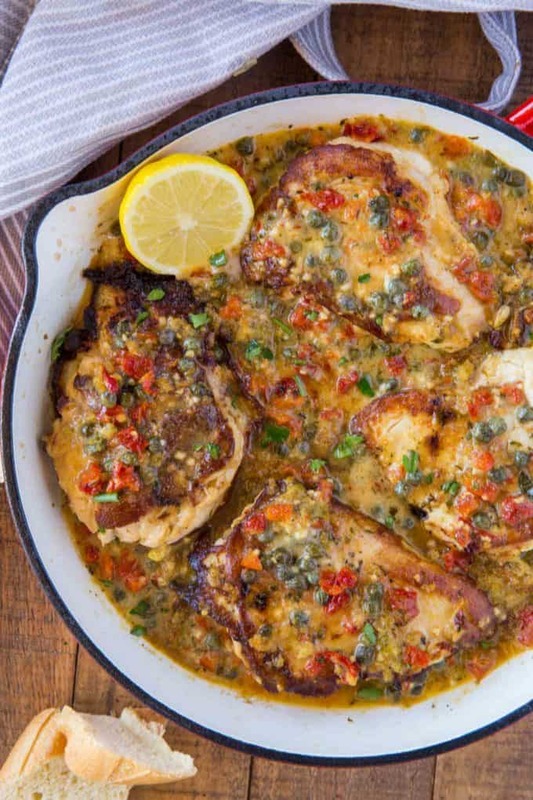 Chicken Piccata is a classic recipe of capers, butter and lemon. The Olive Garden Version also adds in heavy cream and sun dried tomatoes which add a huge burst of flavor! The original version at Olive Garden is served with slices of zucchini that are baked with Parmesan cheese. 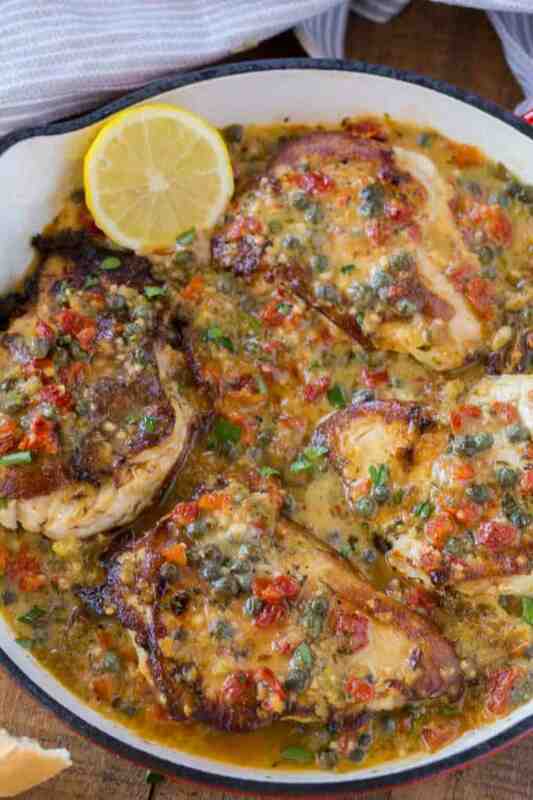 Here’s a great Parmesan Zucchini recipe you could serve along side this chicken piccata. We also love to serve this with pasta, because, well, all Italian food is better with pasta. We find the recipe works best with angel hair spaghetti or thin spaghetti. Please note, one of the most important things in this recipe is that you filet the chicken breasts into smaller, thinner pieces. This method was used on a healthier Teriyaki Chicken over on Cooking with Points. On a plastic cutting board (wood boards can contain scratches that can’t be cleaned effectively), place the chicken on the board. Place your hand over the top of the chicken, flat/open onto the chicken. Use a sharp knife (serrated preferred) to slice through the middle of the chicken breast , slowly through to the other side. You should have two equally thin pieces of chicken that are the same shape as it used to be when thicker. Capers are flower buds from a Caper Bush (also called a Finders Rose). You can’t actually eat raw capers off the bush as they’re much too bitter. When pickled they become much more mellow over time. They’re a mixture of a salt and acid which adds a punch of flavor to your recipes from pasta to bagels with lox. Sun Dried tomatoes are expensive and actually easy to make (especially during the summer months when we’re overwhelmed with tomatoes!). Wash your tomatoes and remove the seeds. Then sprinkle with a bit of salt and bake at 200 degrees until the texture is dried and chewy. Store in olive oil until you’re ready to use. 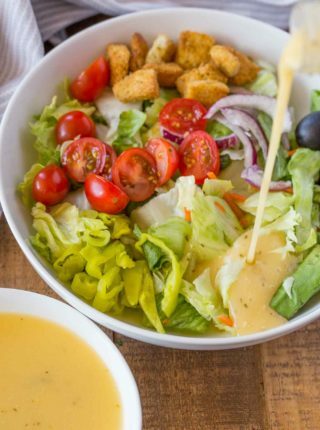 Looking for more Olive Garden Recipes? Looking for more delicious Copycat Recipes? Capers: No real substitution for these, I love this brand. Sun Dried Tomatoes: Love this brand, great flavor and plumps up well in the recipe. Skillet: Cast iron, enameled or not is my favorite skillet for creating a good sear and even heat in reducing sauces. 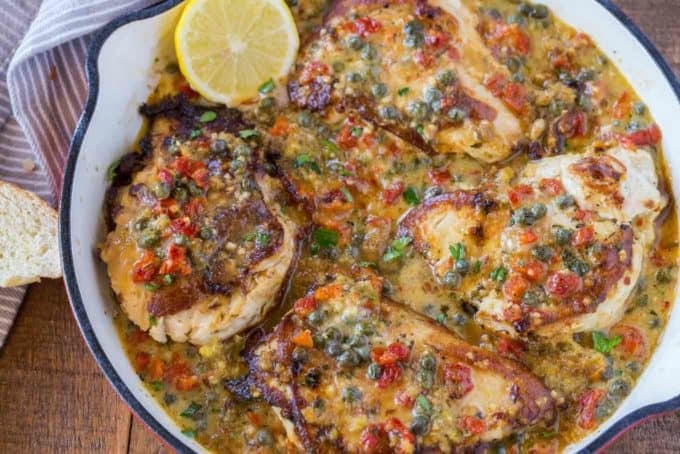 Olive Garden's Chicken Piccata is a delicious take on the classic with butter, lemon, capers, sun dried tomatoes and heavy cream. You won't miss the restaurant version! Season the chicken with salt and pepper and coat in the flour. Add the olive oil and 2 tablespoons of butter to the skillet on medium heat. Add the chicken and cook for 5-7 minutes on each side. Remove the chicken from the pan and add in the garlic and shallots and cook for 1 minute or until it gets aromatic. Add in the chicken broth and lemon juice and reduce the heat to medium, whisking well and cooking for 5-7 minutes until thickened (and can coat a spoon). Add the remaining butter, sun dried tomatoes, capers and the heavy cream to the pan and whisk well. Add the chicken back to the pan and coat with the sauce, letting it thicken for just 1-2 minutes before removing from the heat. Garnish with parsley if desired before serving. This recipe turned out amazing. Followed the recipe exactly and then added Parmesan and doodles at the end. So delicious and a beautiful plate. Thanks, Al! So glad you enjoyed it!! I just found your page today. Your copycat recipes look very close based on your ingredients. As a photographer I am enjoying the photos the most. Any chance you know the calories and fat nutrition? Sorry I don’t have the nutritional facts for recipes on the site but I know there are a lot of free resources on the internet from when I’ve cooked for clients with low calorie diets. This looks really flavorful! Perfect for weekend dinner! Your pictures are making me hungry! That looks so delicious! Oh my this looks amazing. I can’t wait to make this at home!! Yum, this looks amazing! Need to make soon! 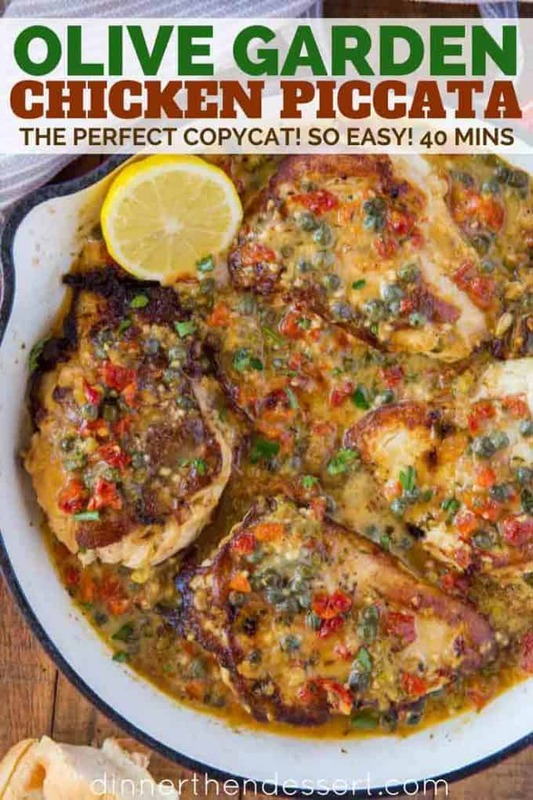 Copycat recipes are my favorite and this one tops the list. I love a good copycat too! Enjoy! !